What does ancient Greek philosophy have to do with entrepreneurship and invention? Plato made a distinction between the concepts of form and substance. There are a number of related concepts from other philosophers of that time, but we’ll focus on these two terms first. You could have form without substance (math, etc. ), or form with substance (organized matter), or substance without form (a chaotic mess). Nearly every idea and interpretation in the ancient Greek world could be placed as a range on this continuum between pure concept and pure chaos. Stars were unmovable perfection, planets (and the Greek gods associated with them) less so (hence all the many loves of Zeus and various other less-than-perfect behaviors). As for humanity, “…man was given a towering head and commanded to stand upright, with his face uplifted to gaze on the stars of heaven.” (Metamorphoses 80-89) In other words, you may in part be a chaotic animal, but you can perceive unchanging ideals (Logos), and be guided by them like a sailor following stars through a chaotic sea. In the painting above, Plato (left, pointing up at the heavens) and Aristotle (right, hand flat and representing the earth) represent the split between heavenly abstraction and terrestrial specifics. In the category of substance, we put anything that is matter – the human body, 20 tonnes of steel in a warehouse, and the device on which you are reading this. The information itself is form – the device is substance. Additional synonyms in today’s economy would be commodities, hardware, and real estate. In the category of form, we put anything that is not physically bound to matter. These are things like math, information, data, and so on. It can also include more personal concepts such as love, responsibility, and virtue. Additional synonyms in today’s culture would be data, information, and software. In Plato’s thought, the idea was that there were perfect mathematical forms off in the heavens, and every attempt at a perfect form, or crude attempt at one, was simply a “shadow” of this conceptual mathematical geometry off in the ether. Aristotle was more focused on physical substance than perfect forms, on the concrete rather than the abstract. In another sense, they represent the opposite directions of taxonomy. Plato’s perfect forms represent a way to see many entities by common attributes, and therefore groups information into categories. Aristotle was seeking to classify things by their differences into specific, individual entities. We usually hear the word taxonomy in two fields. The first is science, where genus, species, and so on are used to divide and group classifications of life forms. We also see it used for other areas such as geology, chemistry, and astronomy. The other area we see the word taxonomy is in database design. Business analysts use the term to divide information and group it in ways that allow databases to be built logically and at a maintainable scale. The process of breaking things apart and putting them back into cleanly-organized attributes is called database normalization. And he to me: "Because you fix your eyes, again, only on earthly things, you produce darkness from true light. That infinite and ineffable good, that is up there, rushes towards love as a ray of light rushes towards a bright body. The more ardour it finds, the more it gives of itself, so that, however far love extends, eternal good causes its increase: and the more people there are up there who understand each other, the more there are to love truly, and the more love there is, and, like a mirror, the one increase reflects the other." Division (substance) has the following attributes: when one divides a collection of matter, one reduces the value of the source of the collection by subtracting matter from it. Property can be divided. One benefits by taking that which is material and consuming it, such as food or fuel. Information is more valuable if it is proprietary, because goods made with that information can be scarce and therefore valuable. Units of value are represented as money or units of commodities or finished goods. Since humans inhabit the physical world, we need these things – food, fuel, clothing, and so on – to survive. If there are no external sources of value feeding the system, it is a closed system. Players in this closed system, if that system is static and lifeless, are justified in seeing it as a zero sum game, where no one can add value without someone else loosing it. During the Mercantile Age from 400 to 250 years ago, this was the prevailing aspect of western thought. Nations had very strong state control of economies to maximize the value of export and minimize imports. They banned the export of gold and silver, limited wages, and tried to maximize domestic resources while restricting consumption. In Partnership (form), value is represented by knowledge, data, or virtues. Knowledge can be copied indefinitely rather than split, and it gains in value to the culture the more it’s copied. Anyone who takes knowledge can benefit. On the virtues, integrity can be modeled for others, and both the others and the modeler will grow in integrity. Information is more valuable if it is openly distributed. Since humans are social creatures and knowledge workers, we need Partnership to survive. This is an open system. It allows for value to be created within itself from art and science. It also allows learning to come from outside sources without depriving those sources of those information assets. Information can be readily copied to spread value across more recipients. In this 700-year-old poem, we also see the core concepts of the Open Source movement. Culture becomes richer as work is shared within the information (form) aspect of the world. Open source servers such as Apache and operating systems such as Linux have revolutionized web design, education, software development, and communications. In the beginning, the open source version of the Unix operating system, called Linux, was considered inferior because it was considered impossible to get the same quality standards with thousands of volunteer contributors as it would be with a team of hundreds of dedicated, skilled employees. But a funny thing happened. They eventually realized it was superior to the commercial product for that very reason. It was being “tested” by millions, and in a community like this, well… To paraphrase Dante, there are more who do quality control, and the more quality there is, and like a mirror, the one increase reflects the other. Open Source Linux blunted the growth of the Windows Server operating system, which was ascending steadily until it suddenly went flat in the mid-1990’s. As the web became a market, Linux servers exploded in popularity and along with them, became the basis for most web systems. Open source dramatically dropped the barrier of entry to becoming an inventor, a creator, a writer, programmer – really any task that involves creating in forms or learning the forms behind a physical task, such as the knowledge (form) on how to fix a sink (substance). If　you want to do 3D CAD design work or model chemical reactions, you have a choice between $5000 professional tools or free ones that will take a little more effort to learn, but produce the same results. Classic writings that were out of copyright became available for free thanks to Project Gutenberg, so anyone could learn the knowledge of the past as well as build the future. The line between form and substance intersects when we talk of 3D printers. There is an odd “Digitophany” (digital made manifest, or visible) that makes even crude 3D printers seem very slightly mystical in their form and function. I can take a file, download it, and then send it to my printer to make a physical object out of plastic. The cost of this object is the cost of the plastic by weight. I can modify these forms or create entirely new ones on my computer, then convert them to substance with a combination of plastic, energy, and time. In the modern information economy, the line between the value of knowledge and the value of goods is far less clear than in past history. That said, a 3D printer is useless without a few kilograms of substance with which to print. There is another place where the line between form and function blurs, and the ancients knew this as well. Humans are also a mix of form and substance that knows itself and the universe. The human is a form that can make form – that is, abstract ideas, and a substance that can shape substance. Where humans are unique is that we can take forms that never existed before and shape the material world into substance that has never existed before. We’ll get more into that in the next section. Humans are a messy mix of pure abstract logic and pure chaotic mud, but we are unique in that we embody the whole range between form and substance. Our robotic efforts are a subset of this mix of abstraction and material – a child effort made in the image of their creators. If a human is soul and flesh, then the robot is math and metal. Building on the concepts of Form and Substance, we’ll get deeper into how the mind invents in the next section. Humans require both bits and atoms because, being creatures with both bodies and brains, we require both to survive. Our closest analog to that are robots, which require both hardware (a body) and software (a mind). While we talk much today about cloud computing, that simply means you are using hardware on your desk to access something on someone else's hardware in a remote location. Bitcoin and other crypto-currencies are very odd amalgams of form and substance. They are purely digital, but they share the properties of matter because the money can only exist in one person's account at a given time. It does this by leveraging the tools available to data to give it the account balances the properties of matter. Let me give a simple analogy. Imagine a room with 100 people. Everyone is given a columned pad of paper and pen. I go in front of the room and announce, "this is Bob. His account number is ABCXYZ. I am giving Bob $100. The serial number of the $100 bill is 123456. Write it down, along with the date and time." Once everyone writes it down, there are 100 copies of the record that a specific $100 has left my account and gone to Bob's account. If I attempt to write in my ledger that I actually only gave him $20, or Bob attempts to write in his ledger that I gave him $500, the other sheets in the room would "outvote" our sheets. You would have to have over 50 percent of the sheets in the room to override the transaction record. In cryptocurrencies, this is called a "51 percent attack". It can only be done on currencies that are on very few ledgers. The ledgers are represented by the digital "wallets" of various users of the cryptocurrency. If someone buys something in Bitcoin, Etherium, or another cryptocurrency, copies of the transaction are made all over the world. This bypasses the need for a physical bill (material scarcity) or a central bank (trusted third party) to verify the transaction. This is a rather odd but conceptually beautiful way to combine form and substance in a way rarely done in the past. There is a similar concept in the study of older texts. If the ten most ancient copies of a work by Plato, particularly ones scattered around a region of the world and translated into different languages, agree on the text, we have some validity to the text. If there are a thousand copies of Christian gospels scattered in many areas within a century of the life of Jesus, we have validation that they reflect the original texts because the ancient world could not make that many copies in that many locations that quickly. If those works have very few textual differences, we have some validation that the texts are accurate representations of their source material. Conversely, if a "lost gospel", appears recently in a remote location, and reflects the culture of that location rather than the culture of the time and place of Jesus, we have little reason to assume it has any reflection on anything but the place and time where it was actually written. The original texts survive as "canon" (authoritative) despite a later attempt at a "51 percent attack" by Hellenistic Gnostic culture. This was nothing new to Greek or Roman culture. There were many attempts at producing works and ascribing them to famous philosophers or poets. Virgil's Aeneid attempts to pick up where Homer's Iliad and Odyssey left off, and converts the Greek heroes into Roman ones. 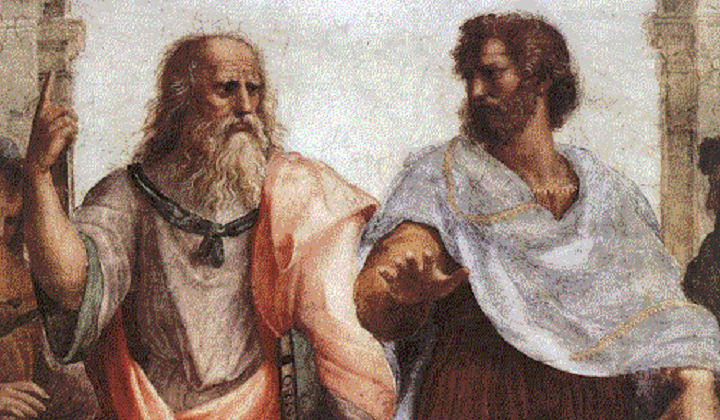 Even Plato's writings about Socrates shifted between his earlier and later biographies. It appears that Plato was appealing to the authority of his mentor, even as his own platonic philosophies were evolving long after Socrates died. In a way, Plato was attempting a 51 percent attack on his younger self. And so we go from Plato to Bitcoin and back to Plato again. Which brings us back to one more attribute link of form and substance. Information without a container disappears literally as fast as light is absorbed. Information with a material container that can be copied to other containers will outlive any material substance. Even after the sun burns out, the radio transmission of e-books via Internet relay satellites will carry Plato, and even this humble web page, beyond the galaxy in thousands or millions of copies. While the information would be distorted by radio noise from stars and nebulae, there may be enough copies of it on enough beams that could be reconstructed. While there won't be enough readers of this text for that to happen, it's an amusing thought to consider a future distributed robotic race of aliens spending eons rebuilding the visage of Grumpy Cat.